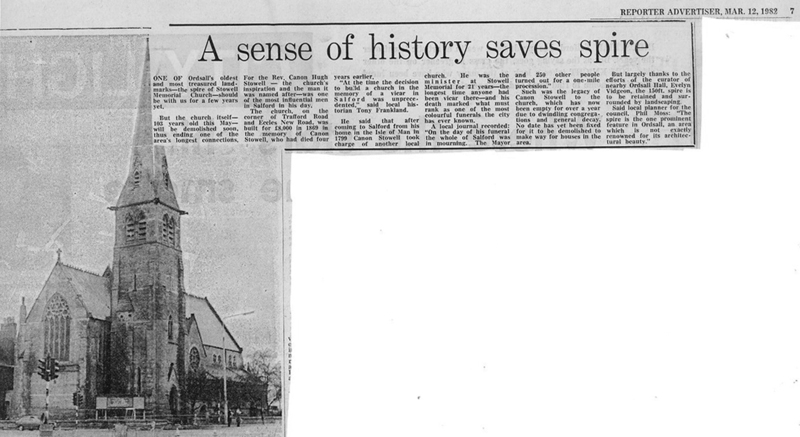 The Reverend Canon Hugh Stowell's career in Salford began when he became curate of St. Stephen's, the second oldest church in the city. 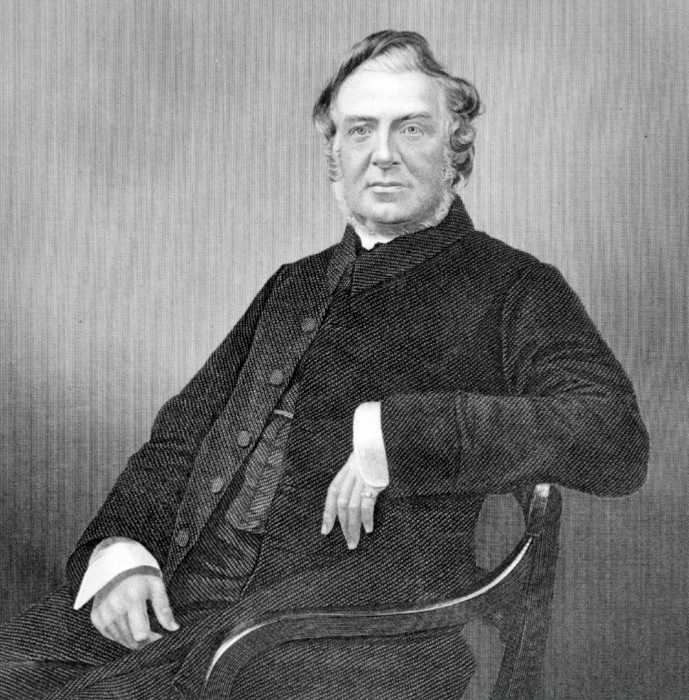 During his curacy, he became hugely popular as a devoted minister and energetic preacher. In order to retain his services, the parishioners raised a large sum of money to build a church for him, which became Christ Church in Acton Square. Stowell remained at Christ Church from its consecration in 1831 until his death on 8 October 1865. He was buried in the church's graveyard. Stowell Memorial Church, located on Eccles New Road, was built by public subscription after Stowell's death to honour his life and work. 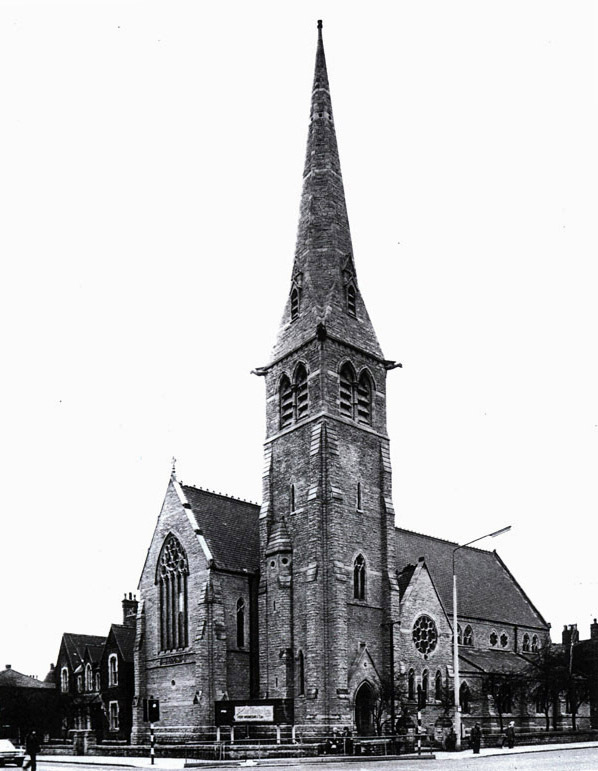 The foundation stone of the church was laid on 19th October 1867, and the church was consecrated by the Bishop of Manchester, James Prince Lee, on 14 May 1869. 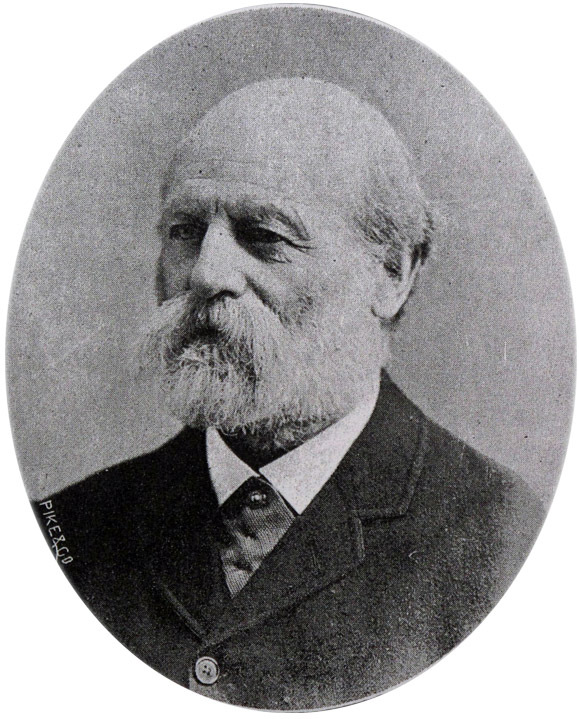 James Medland Taylor (1834 -1909) was the architect, and the cost of construction was £8,000. Stowell Memorial Church, Salford—A reredos, from the design of Mr. John Lowe, Architect, Manchester, has recently been erected in this church. It is of varied stone, enriched with marble, and extends the whole width of the chancel. The lower portion is of Darley Dale Stone, and the upper of Caen. This upper portion consists of five gabletted panels, the three central being so combined as to form a centre-piece. The panel-shafts are of red granite, relieving the white Caen and supporting pointed arches, having also carved caps. In the centre of each panel is a raised field with carved emblems (eg. wheat, vine, passion-flower, &c.), and bearing appropriate inscriptions. The tympanum of each gable is a diapered surface of Styperson stone, in the centre of which is a circular panel of Caen stone enriched with various coloured marbles. Crocketted pinnacles separate the gables (which are also crocketted), and all terminate in curved finials. The whole is the gift of a lady in memory of two friends of the late Canon Stowell. The builders were Messrs. Ellis & Hinchcliffe, Manchester. Stowell Memorial Church, Salford. A stained glass window has been placed in the chancel of this church. It was designed by Mr. F. Holt, of Warwick, and executed by Mr. J. Kirkley of Salford. (The British Architect & Northern Engineer v. 10 1878). Another stained glass window commemorated the fallen of World War I. Stowell Sunday School also had a war memorial. Stowell Memorial Church closed in 1981, and was demolished two years later. The spire was left as a cenotaph for a bygone community, one that had once celebrated its rites of passage there. Standing to a height of 149.93 feet, the spire is employed as a telephone mast! Rev. Hugh Selwyn Taggart was born 21 March 1874; son of Rev. 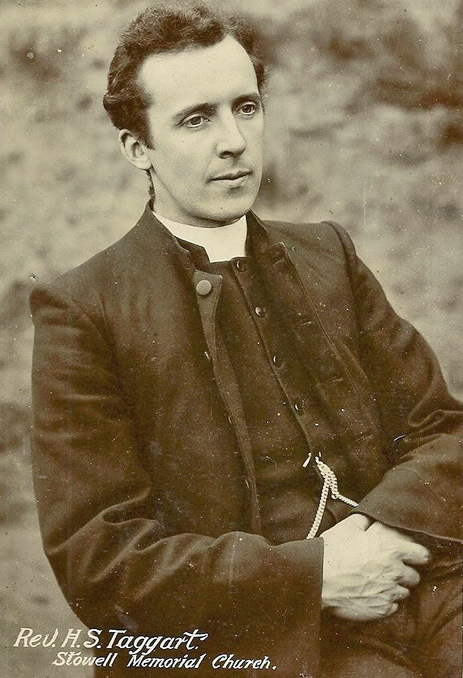 Canon Thomas Arthur Taggart of Douglas, Isle of Man, He became vicar of Stowell Memorial in 1904, after leaving St. Bartholomew, Salford. He died in 1956. My beautiful spiritual home every Saturday and Sunday in my beloved church as a child . Shame the council had no decency to have kept this beautiful church untouched! Part of Salford history gone!